A postcard from our friend Rachel who is currently touring around Australia. 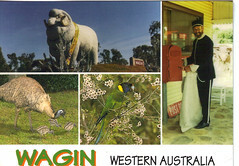 Wagin is famous for grain growing, livestock, sheep, and the two day “Woolorama” which attracts sheep farmers from all over the country. Rachel says she spent about a week in Wagin at the carava park, and liked it so much that she thought she could easily live there. Thanks for the postcard Rachel!